Tucked away on an industrial estate in Woolwich, The Hangar is the most open and readily accessible space in London for skill training. 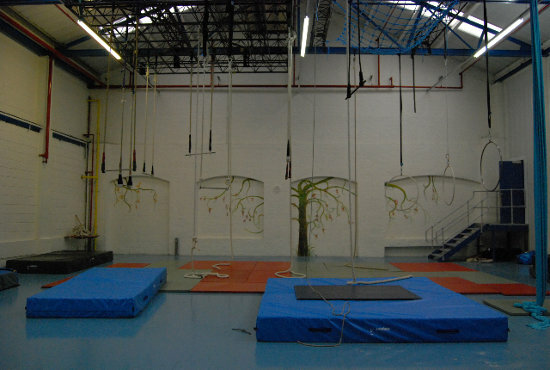 It's a large warehouse, with studio and rehearsal spaces, and a top-floor aerial mezzanine that independent professionals can (once assessed) train in under the space's Airtime scheme. It's a big, relaxed place, usually not too full as it's in an area of London that's hard to get to from some quarters. The Hangar has a large space heater, but in winter, like many big warehouses, is very cold. It's run by the company Aircraft Circus.